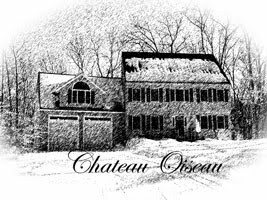 Chateau Oiseau: Chilean grapes are here!!! 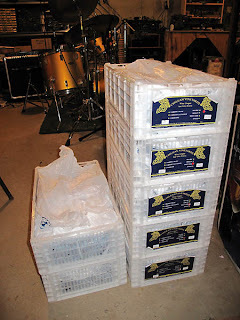 I was pretty happy to get a call that the Chilean grapes were going to be ready for pickup this afternoon. Yes, it's spring here, but it's autumn in the southern hemisphere! Harvest time! I cleared my schedule and drove over to Woburn to pick them up at Beer and Wine Hobby. As you may recall, I ordered them back in Feb or so. I ordered 7 boxes of Pinot Noir and 7 boxes of Malbec. Each box is about 18 pounds of grapes. The rule of thumb is that 20 pounds of grapes makes about a gallon of finished wine. Since I want to be sure to have enough grapes to make a full 6 gallon carboy of each type, I would need 120 pounds of each varietal. So 7 crates is 126 pounds...should be plenty. 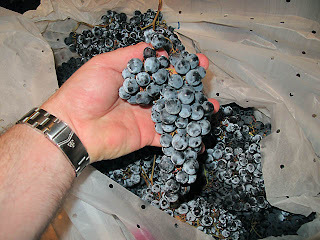 So the pinot is going to do a couple days cold soak to extract some color from the skins before we start fermentation. 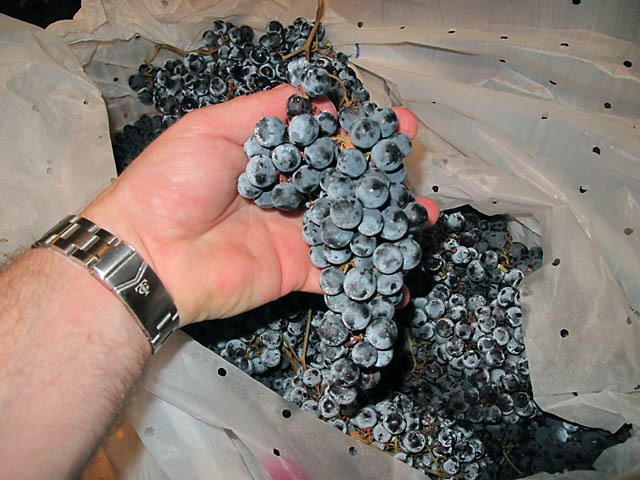 This is pretty standard operating procedure for pinot noir because they have thin skins and don't put a lot of color or tannins into the wine if you don't extend the maceration time a bit beyond the fermentation schedule. So, I'll wait a few days before warming the must and initiating fermentation. Then it was on to the Malbec. I was annoyed about the quality of the Malbec grapes. In contrast to the nearly perfect pinot grapes, the Malbec was pretty sad looking. One of the 7 totes had absolutely perfect fruit. The other 6 had a lot of shriveled raisin-looking grapes. I paid for grapes, not raisins. 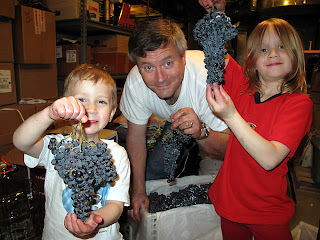 I would say 10% of the grapes were shriveled and dried looking, so I did not put them in the fermenter. Good thing I ordered plenty. It was interesting to taste the Malbec and the pinot grapes side by side. They tasted quite similar actually, except the Malbec have noticeably thicker skins. Pinot would be tasty to just munch on, except for the seeds of course. Table grapes, they aren't. 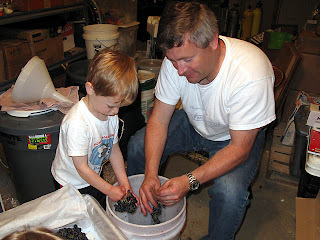 Anyway, the whole family came down to help out with the destemming of the Malbec. 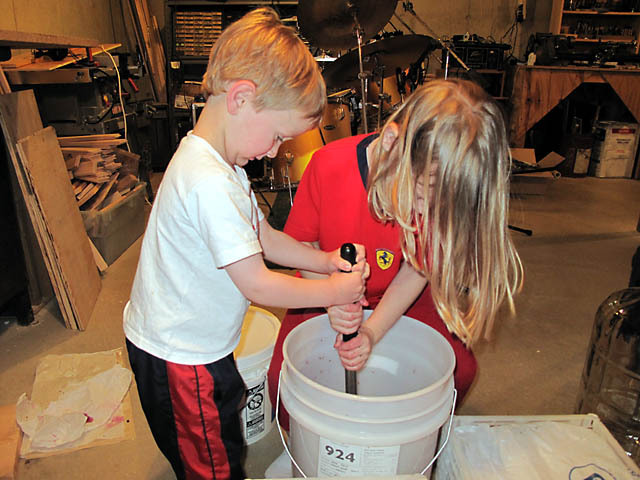 Even the 3 year old got involved and did a pretty good job too, except for dropping a few on the floor. Christine pitched in destemming and crushing but since she took the pictures, she was on the wrong side of the camera for the blog. Once the Malbec was destemmed, it went into the other fermenter and I set the temp of my thermostatic control unit to 85 F. Yes, I bought a thermostatic control unit. Last time, my fermentation temps were all over the place because I was trying to do it manually by turning an electric blanket up and down. Now at least I have a little more control over the temperature. Basically, you just have a probe that goes in the must and it turns the power to the heater on or off based on a set point. I'm still using an electric blanket around the fermenter...it's low-tech, cheap, and works great. The cellar is 60 degrees right now, so once the must makes it to 75 or so, I will initiate fermentation with an inoculation of RC212, a nice yeast that is isolated from Burgundy, France. It is good on both Malbec and Pinot Noir. In a few days, the house will have that wonderful smell of fermenting wine! Can't wait! !